First John focuses on the truth about loving God, the truth about loving people, and the truth about the difference Jesus makes. Second and Third John and Jude all focus on the truth about bad religion and how Christians must take a stand against bad teaching, bad leading, and bad living within the church. This study will focus on those four truths and guide readers on a quest for truth in our day. To read these old letters is to read the words of people who loved the truth, especially the truth they had discovered in the life, death, and resurrection of Jesus Christ. This was the truth they held most dear, the truth that had transformed their lives, and the truth they felt was under attack in the early church. Studying these four letters will challenge readers to consider their own truth— the truth that governs their lives and the truth they feel is worth living and dying for. In a world where truth is a slippery reality, 1, 2, 3 John and Jude remind us that truth does exist and that truth still sets people free. Judson Edwards is the author of thirteen books, including Quiet Faith: An Introvert’s Guide to Spiritual Survival. Jud served as pastor of the Heritage Park Baptist Church in Webster, Texas, and the Woodland Baptist Church in San Antonio, Texas, until he retired in 2010. He now lives in Cedar Park, Texas, and devotes his time to writing. This Teaching Guide for the Smyth & Helwys Annual Bible Study on 1, 2, 3 John and Jude includes teaching options, suggested worship and sermon outlines, and approaches to leading discussions and group study. This study also includes relevant lesson plans for including youth and children in a congregational study of 1, 2, 3 John and Jude. 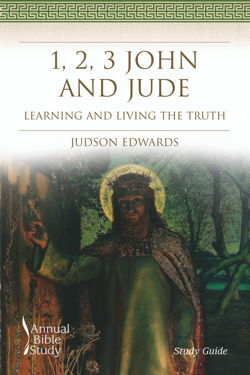 This Study Guide for the Smyth & Helwys Annual Bible Study on 1, 2, 3 John and Jude serves three purposes: to educate the learner on major issues of appropriate interpretation, to offer an overview of theological themes, and to build the learner’s Bible study skills by reviewing significant interpretations.